Get the Year Noted paper kit and embark on a yearlong scrapbooking adventure! In celebration of National Papercrafting Month, Close To My Heart invites you to reflect onthe things that make you who you are and on what you want to accomplish in the coming months. Then, with the help of the Year Noted paper kit, record your experiences and goals! the exclusive Year >> Noted paper kit (which has a retail value of over $24 USD) for only $5—that’s over 80% off retail! 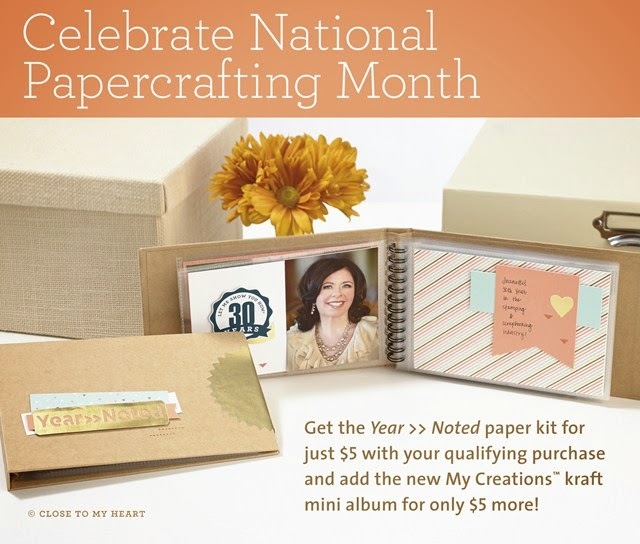 Or, for an additional $5, you can order the Year Noted paper kit with an accompanying My Creations™ kraft mini book. The paper kit for both options includes a C-size stamp set, stickers,cardstocks, and B&T Duos™ papers, all specially designed to coordinate with the My Creations™ kraft mini book so you can have a yearlong scrapbooking experience. This means you will receive over $34 USD worth of product for only $10 if you purchase the kit with the accompanying mini book! But the fun doesn’t end there—included on the sticker sheet, you will find a large golden seal. Once the year is done and all the pages are filled, seal up your book and create a mini time capsule that you can open years from now. Remember, this deal is only available for January, so make sure to get your own Year Noted paper kit today for the perfect start to a crafty year! *Offer valid January 1, 2014 (9:00 am MST)–January 31, 2014 (11:59 pm MST). Shipping/handling is calculated based on the full retail price of the discounted items (without My Creations™ kraft mini book: $24.56 USD; including My Creations™ kraft mini book: $34.51 USD).